Three Pitkin County commissioners were empathetic Tuesday about a citizens group’s goal to abandon Eagle County and annex into Pitkin County, but that didn’t translate into support. Newman, who lives in the Emma area, said it is clear that the area in question — El Jebel, part of the Basalt area, and portions of Missouri Heights and Fryingpan Valley — are physically and socially connected to the Roaring Fork Valley. The original county boundaries should have been drawn to reflect that connection within the Roaring Fork River watershed, he said. Instead, an estimated 8,335 residents live in the western Eagle County portion of the midvalley and are governed by a county government based 50 miles away in a different mountain valley. Ken Ransford, a Missouri Heights resident and accountant in Basalt, is leading the efforts of a group called Our Valley Our Voice to pursue the exit from Eagle County and annexation into Pitkin County. He said midvalley residents share more of a community of interest with Aspen and the Roaring Fork Valley than Eagle and Eagle River Valley. He has also been critical of Eagle County’s looser regulation of growth. Newman said he understands the impetus for Our Valley Our Voice’s efforts on land use issues. It was a “poor decision” by the Eagle County Commissioners to vote 2-1 to approve Ace Lane’s Tree Farm project, he said. The project, which hasn’t been constructed yet, allows up to 340 residences and 135,000 square feet of commercial space in the El Jebel area. Pitkin County staff researched the statutory process needed to make the switch and its economic impact. Pitkin County Manager John Peacock reported the results of the research to the county commissioners Tuesday. State law sets a high bar on the action, presumably because leaders of the fledgling state didn’t want the county boundaries easily manipulated, Peacock said. The Eagle County boundary was set in 1883. By state law, the proponents would have to collect signatures from 50 percent of “taxpaying, qualified electors” in the area proposed for annexation to get the measure on the ballots of Pitkin and Eagle counties. Peacock said it wasn’t clear without more digging what was meant by “taxpaying, qualified electors.” Presumably it’s property taxpayers, he said. “There’s not been anyone before us that’s gone through the process,” Peacock said. The city and county of Denver were able to use a specially crafted law to vote on annexation of property used to build Denver International Airport. If the midvalley group collects the required signatures, the commissioners of both counties would have to put the measure on the ballot. The entire county electorate would be eligible to vote. “It’s a simple majority in both counties” for approval, Peacock said. Commissioner Rachel Richards said she was uncertain how much support there is among midvalley residents to change from Eagle to Pitkin County. The core support probably comes from ex-Aspenites who moved downvalley, she said. Proponents are underestimating the “love/hate relationship” that many residents of downvalley areas feel with Aspen and Pitkin County, Richards said. While there is a physical connection, some midvalley residents would bristle at the thought of being under political control of the upper valley, she said. The annexation of the midvalley would increase Pitkin County’s population by about 47 percent while decreasing Eagle County’s count by about 16 percent. In addition to the immediate increase in population, Richards pointed out that Pitkin County would also inherit approvals for hundreds of residences that are approved but not yet built. “I think it’s very risky to the citizens of Pitkin County,” she said. The Pitkin County staff analysis showed that the Eagle County portion of the midvalley would generate about $3.69 million in annual revenues while requiring $9.98 million in operating expenses and debt service. That would create a new cost to the county of $6.3 million. Peacock said the staff was confident in the revenue estimates. The expenses are harder to estimate but the figure was within 10 percent, one way another, he said. “The cost for Pitkin County to take this on — there’s no benefit,” Newman said. Commissioners Patti Clapper and Greg Poschman weren’t present for the discussion. Newman, Richards and Commissioner Steve Child directed the staff not to spend additional time on annexation unless the issue advances to the ballot. He questioned Pitkin County’s estimated expense of taking on western Eagle County. There’s no new infrastructure or a higher level of service required, he said. 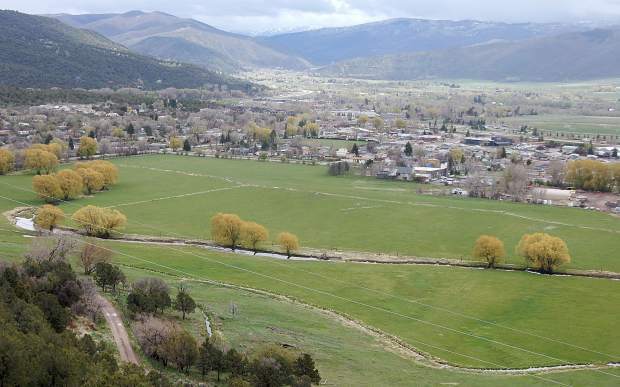 The Pitkin County Sheriff’s Office would take on the brunt of the annexation. It would have to patrol a larger share of the valley. Our Valley Our Voice members had hoped that the commissioners in both Pitkin and Eagle counties would be willing to place the annexation question on the November ballot — without forcing the proponents to collect signatures. A requirement to collect signatures from 50 percent of the taxpaying, qualified electors in the midvalley is unreasonable, according to Ransford. One possible route will be getting the state legislature to look at amending the requirement. Ransford said the number of signatures required should be 10 percent of the voters who turned out in the last election. Ransford’s frustration over the lack of traction for the annexation idea was clear Tuesday.